To get information about future camps, please click here. A host of boys and 3 dads from Wisconsin, Michigan, Illinois, and even as far away as Kansas, Texas, and South Carolina attended the 2016 Call to Chivalry Camp in Baraboo, Wisconsin. Participants enjoyed good weather -- except for heavy rain during the treasure hunt -- and the camp was a blessed event. The one-week adventure took place for the second consecutive summer at Durward’s Glen Retreat center, a beautiful Catholic facility surrounded by forests. There is a pond, creek, a large yard perfect for field games, and a hill adjacent to the creek which is perfect for boys to climb and explore. And of course, the property is blessed by the True Presence of Our Lord in the chapel. Participants and staff would pray together, daily, in front of Our Lord in the Blessed Sacrament, asking for strength and guidance to face daily trials as well as for the battle against the modern world. 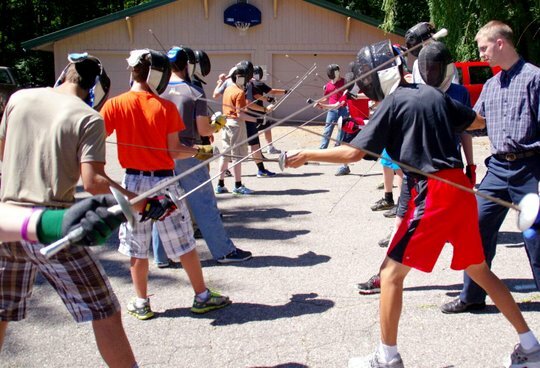 Throughout the camp, the boys were given fencing lessons, played vigorous sessions of field games such as steal the bacon, capture the flag, prison break, British bulldogs, blind “chariot” races, shield ball, circular dodge-ball, wheelbarrow races and relay races. The treasure hunt and shield ball were two favorite activities. The talks are always a favorite too! This year’s theme was The Heroes of Catholic Spain. The presentations and talks during the camp were: the Epic Battle of Lepanto, Don Juan of Austria’s heroic defense of Europe against the Turks, the Great Weapon of our time: the Rosary, St. Ignatius of Loyola and his fight against the Protestant Revolt, the Catholic Heroes during the Spanish Civil War, and the Siege of the Alcazar. Perhaps the most notable outing was the street campaign against abortion. Standing in front of the Planned Parenthood facility in Portage, Wisconsin, participants held signs in defense of the unborn, reading: “Real Catholics do not compromise with abortion!” “Honk against abortion!” “Purity is the answer!” and “Defund Planned Parenthood!” The boys were visibly enthusiastic while publicly defending the innocent unborn. 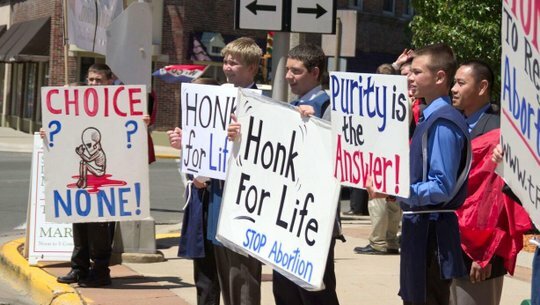 Most passers-by were in favor of the pro-life display, and the street resounded with the sound of honking horns. May Our Lady bring more young men to learn and imitate the virtues of Chivalry so needed in our modern world.